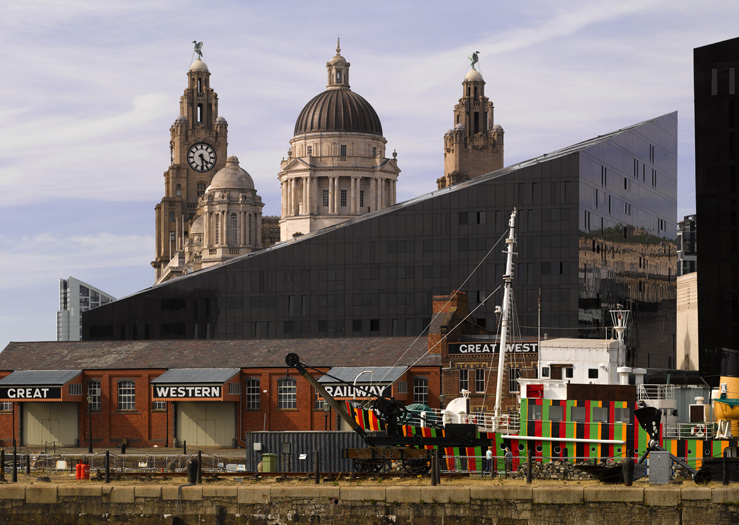 Liverpool(e): Mover, Shaker, Architectural Risk-Taker is the first exhibition at RIBA North, the new national architecture centre on the Liverpool Waterfront, which opens on 17 June to the public. Celebrating Liverpool’s architectural ambition and history, the show features over 30 original drawings, models and watercolours from the RIBA Collections for designs for Liverpool that were never realised. Many of the drawings are on display to the public for the first time thanks to National Lottery players, as they have been restored by a £67,000 grant from the Heritage Lottery Fund (HLF). Collectively, they reveal much about the process behind Liverpool’s development, from architectural competitions to speculative ideas that were not realised. Dating from the 1700’s to the mid 20th century, highlights of the exhibition range from a Seaman’s Memorial on the Waterfront to drawings by Sir Denys Lasdun, Sir Edwin Lutyens and Sir Giles Gilbert Scott for the city’s two famous cathedrals. In a newly commissioned film, leading architects look at Liverpool’s architectural audacity, its willingness to consider unconventional schemes and how this maverick enthusiasm has resulted in the dramatic and celebrated skyline we see today. Amongst the ambitious proposals is a design for the Liverpool Anglican Cathedral by Sir Charles Archibald Nicholson from 1901/1902. He proposed a hexagonal space with pairs of unusual radiating transepts, like the petals of a flower. It would have been roofed with a dome, and the transepts would have had huge windows, flooding the space with light. Sir Giles Gilbert Scott won the contest but Nicholson was able to reuse his idea for the chapel of Clifton College in Bristol. Stirrat Johnson Marshall envisioned a bridge over St James’s Cemetery with thrilling views for an exercise at Liverpool School of Architecture. He envisaged a ponderous Gothic viaduct with a dizzying height. Another vast-scaled idea on display is by Graeme Shankland who reinvented Liverpool’s skyline. On a two metre wide panorama visitors can get a glimpse at what the planning consultant imagined for an urban renewal after two thirds of the city’s buildings were declared to be obsolete during the 1960s. At the same time, Sir Denys Lasdun wanted to introduce his new Brutalist style to Liverpool. The architect, who is well-known for the National Theatre in London, designed a new Roman Catholic Metropolitan Cathedral with a distinctive roof of a shallow cone, folded into deep furrows and ridges probably intended to be made of concrete and glass. His entry was rejected and instead Frederick Gibberd got to leave his mark in the city. RIBA North is a new national architecture centre and cultural destination on the waterfront in Liverpool. At the heart of RIBA North is the purpose built gallery space, which will host a bold programme of temporary exhibitions, showcasing new and innovative approaches to architectural practice as well as the historic RIBA Collections, the nation’s richest resource of architecture drawings, photographs and prints, dating from the late 15th century to the present day. There will also be architectural city tours, workshops for young people and children, a selection of talks and debates and a new café and shop. The centre is situated in Mann Island, a building designed by Matt Brook of Broadway Malyan which won a RIBA North West award in 2015. The launch exhibition has been made possible by money raised by National Lottery players and funding from Broadway Malyan. As well as supporting the production of the exhibition the National Lottery grant from HLF enabled the RIBA to undertake conservation on 30 items from the RIBA Collection, making them stable enough to be put on public display for the first time.